Specializing In Big Game Animals From Around the World. Thank you for your interest in Northwest Indiana's most experienced taxidermy studio centrally located in the Midwest. 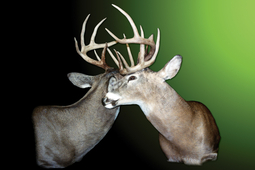 With over 35 years in business, we provide quality taxidermy services and your satisfaction is always guaranteed! Purchase nature photos online below. Check back for discounts and limited time promotions! Copyright 2018 Phares Taxidermy, Inc. All rights reserved.